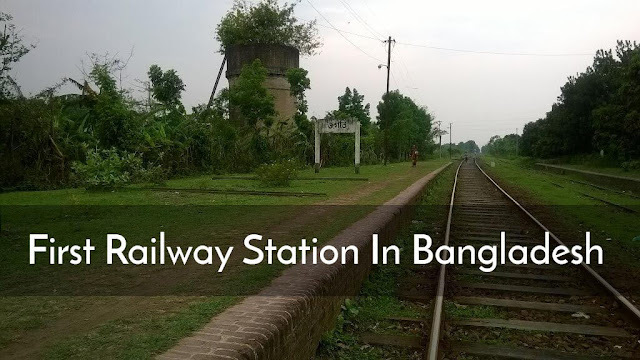 You know the name of the first railway station in Bangladesh? No we are not talking about the first railway station of independent Bangladesh but we are talking about the first railway station in the Land of present Bangladesh. The name of the first railway station in Bangladesh is Jogoti and it is situated in Kustia district to the present Bangladesh. According to sources, the Jogoti railway station was established in 1862. At that time this place became a gathering place of a lot of people due this first railway station and as a result this place became a commercial center and a center of import and export business. At the station there are two big Indira today. To manage the crowd of people once there were 16 railway stuffs appointed to this railway station. But the present situation is different. Now only three men are railway stuffs are working here. Due to lack of manpower the station activities has broken. Passengers are being harassed in different ways. The beauty of the station was lost due to not being reformed or reconstructed for a long time. Because the passengers of the train are not able to get the opportunity, there is no one else in the station. The repair of the station is important. Rail communication system has became popular, but this historical station poorly neglected, hundreds of years of traditional Kushtia-Bheramara Rayota Ghat rail line Due to lack of reform initiative, the stations have become disastrous and kind of abandoned. Need to recall some railway history in Indian the then British ruled sub continent. In the nineteenth century, various railway companies of England started small railway sections in different provinces of India. Initially, railways were built only for economic activities. Eastern Bengal Railway Company first established railway in Bangladesh. The Eastern Bengal Railway Company introduced the Broad Gauge (5-foot 6-inch) railway section from Kolkata to Ranaghat on September 29, 1862 and the rail section from Ranaghat to Kushtia on 15 November 1862. The Goaland section was started on 1 January 1871. From 1874 to 1879, for responding to famine, the Siliguri Section started the northern Bengal State Railway meter gauge (3 ft 3.38-inch). Mett Gauge section from Parbatipur to Dinajpur and Parbatipur to Kaunia also started this company. On 1 July 1884 the Eastern Bengal Railway came into government management and on 1 April 1887 it merged with the Northern Bengal State Railway. On January 1, 1915, the section of Bheramara Sakoli was introduced with Hardinge Bridge. In 1914, the meter gauge section was converted to broad gauge from Shakol to Santahar and in 1924 about 96 kilometer section from Santahar to Parbatipur was converted from Meterground into broad gauge. Bangladesh govt. recently took an initiative to build a railway museum. We hope that this railway station will no more abandoned anyway, they will took it under the railway museum as a historical place, as far as we got proof that Jogoti is the first railway station in Bangladesh.